#10 at North Freedom, April 2000. Today, the vast majority of America’s railroad are standard gauge; the rails are 4 feet 8-1/2 inches apart. But there was an era when several different gauges were common. A narrower gauge was cheaper to build, its equipment likewise frugal to purchase and maintain, and the narrow gauge could negotiate sharper curves and heavier grades than the standard gauge. 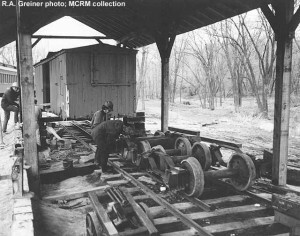 The narrow gauge caveats were smaller carrying capacity, and the inability to interchange equipment with the standard gauge rail system so predominant in the U.S. Freight and passengers had to be transferred to standard gauge equipment at interchange points at great expense. The first American narrow gauge roads appeared around 1870. Within five years, over 2,600 miles had been built. But the boom was short-lived. The need for compatibility doomed the narrow gauge, and most were converted to standard gauge by the turn of the century. Some did survive where it was not feasible to convert, or they did not need to connect with the outside world. Wisconsin hosted five known narrow gauge railroads, totaling slightly over 200 miles, and all were of the popular 3-foot narrow gauge. By far the largest system was in southwestern Wisconsin, where the rough terrain made the narrow gauge a natural. The Galena & Southern Wisconsin was the first, reaching from Galena, Illinois north to Platteville in 1875, a total distance of 31 miles. Another company named Chicago & Tomah had grander plans of connecting the G&SW with the timber region surrounding Tomah. Surveying was completed, but only the section from Lancaster to Woodman, on the Wisconsin River, was completed in 1879. The line also extended east toward Madison. This mini-empire struck the fancy of the big Chicago & North Western, and the lines were purchased in 1881. C&NW swiftly converted all to standard with the exception of 16 miles between Fennimore and Woodman. This short segment had two sharp curves that could not accommodate a standard gauge train. Thus, the “Dinky” as the line was called by locals, soldiered on until eventual abandonment in January 1926. The “Dinky’s” major commodities were milk, cheese, ice (in winter), and railroad ties (which were produced at a station along the line). Passenger service was also offered as roads in and out of the remote area were poor at best. To haul the freight, the little line used about 20 freight cars, including boxcars, a few stock cars, and flat cars. 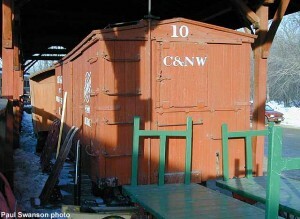 C&NW #10 was one such boxcar of the fleet. Its origins are unknown, but it possibly was built before the turn-of-the-century. Most likely it was brought to the “Dinky” new, as the C&NW didn’t import second-hand equipment until 1910. 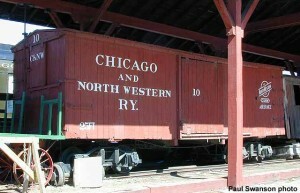 Several photos exist of boxcars on the line, but only one other car number is visible. A sister car numbered #2 was used in work service. It is known the boxcars were used to haul ice in the winter for storage at Fennimore. When the “Dinky” was abandoned in 1926, several pieces of equipment were sold to local citizens for use as storage sheds. #10 was one such survivor. Stripped of its trucks and underbody equipment, #10 sat on a farm until 1970 when it was donated to Mid-Continent. The car was moved to North Freedom and cosmetically restored as it appeared during its service on the “Dinky.” The trucks are not original to #10; a scrapped snowplow from another midwest narrow gauge, the Belleville & Cascade of Iowa fame, acted as donor for the trucks. Today #10 is on display under the shed north of the depot, where it endears the public with a glimpse of Wisconsin narrow gauge railroading.